The Northern Ireland peace process has been heralded by those involved as a successful example of transformation from a violent conflict to a peaceful society. This book examines the implementation of the Belfast Agreement in Northern Ireland, and evaluates whether its goal to establish a normal, peaceful society has been fully realised. Using the political and legal status of England, Scotland and Wales as a comparison, Jessie Blackbourn evaluates eight aspects of Northern Ireland which the Agreement aimed to normalise: the contested constitutional status of Northern Ireland, the devolution of power, decommissioning, the removal of emergency laws, demilitarisation, police reform, criminal justice reform, and paramilitary prisoners. The book highlights the historical context which gave rise to the need for a programme of normalisation within the Belfast Agreement with respect to these areas and assesses the extent to which that programme of normalisation has been successfully implemented. 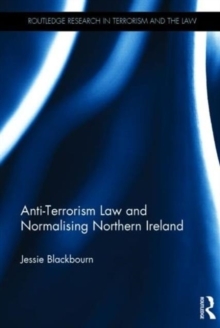 By evaluating the implementation of the Belfast Agreement, the book demonstrates the difficulties that transitional or post-conflict states face in attempting to wind back extraordinary counter-terrorism policies after periods of violence have been brought to an end. The book will be of great use to students and researchers concerned with the emergence, evolution and repeal of anti-terrorism laws, and anyone interested in the history of the conflict and peace process in Northern Ireland.